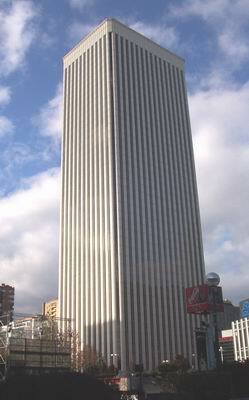 You will find Torre Picasso on Plaza de Pablo Ruiz Picasso in the AZCA financial district of Madrid, Spain. It is a high-rise skyscraper that stand 43 floors above the ground, 157 metres, or 515 feet high. It has 71,700 square metres of office space, a parking capacity for 837 vehicles, it gets daily visitors that number 1,500, and has a working population of 6,000 people. Torre Picasso is not the tallest building in Madrid. There are no less than four others that exceed it in size, all located in the Cuatro Torres Busines Area: Torre Espacio at 236 metres or 774 feet; and Torre Sacyr Vallehermoso also at 236 metres or 774 feet; Torre de Cristal at 249.5 metres, or 817 feet; and the tallest of them all, Torre Caja Madrid at 250 metres or 820 feet high. The four taller buildings were all completed recently in 2007. Torre Picasso was started late on in the year 1982 and had its inauguration six years later in 1988. For a long time it was Spain's tallest building, as on completion it exceeded Torre de Madrid, built in 1957, which stands at 142 metres, or 466 feet above ground. Many of Madrid's business vistors will need to visit the AZCA financial district, where many important companies are situated. Torre Picasso stands within the financial district of Madrid in the AZCA complex, an acronym that stands for, Asociación Mixta de Compensación de la Manzana A de la Zona Comercial de la Avenida del Generalísimo. The construction of this district started in the 1970s and incorporates a number of very tall buildings, including Torre Europa and Torre BBVA. The architects of Torre Picasso were Minoru Yamasaki & Associates. Their design is a simple, though elegant, square box design rising high into the Madrid skyline. The building's most notable feature is its main entrance. This is a wide arch that takes up more than half of the building's width. The arch incorporates a specialised security glass. Canal +, one of Spain's most popular television channels, has its studios within Torre Picasso. However, the rest of Torre Picasso's many tenants are not nearly so well known. The Otis Elevator Company were contracted to modernize the elevators of the building in 2004. They took advantage of this opportunity to install some of the most advanced technology available in the elevator world. Now, though no longer the tallest building in Madrid, Torre Picasso stands proudly as one of the city's most impressive sights.